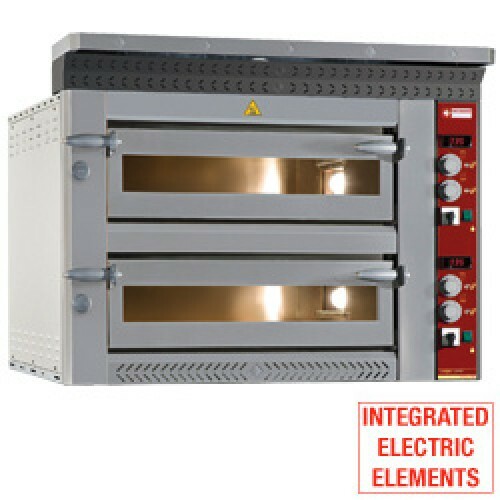 - 2 Chambers: 700x700x150 mm (6,6 kW), 4 pizzas Ø 350 mm. - Stainless steel front side, "decorative" hood, independent and "ergonomic" switch panel in painted steel. - Bottom refractory stones chamber, high thickness fibreglass insulation. - Adjustable steam exhauster, against shock built-in inner light, suitable for high temperatures. - Door with spring system hinge, double thermal handle, large dimensions safety door glass, gasket in ceramic fibreglass. - Heating by armoured electric elements in stainless steel. - Appliances are complied with the CE in force. - Bottom heating elements inside the refractory stones, quick temperature rise, very homogeneous baking, 25% energy saving. - For keeping the heat in the chamber, double vault arcade in stainless steel, avoiding the heat going out when the door opens, and top heating element in scalar position... no more need to turn the pizzas!!. - Double independent thermostats (top and bottom), suitable for any type of pizza. - Digital thermometer as temperature display. - Decorative hood delivered standard.